A guided hiking, canoeing, camping and adventure vacation in the famous Banff, Yoho and Jasper national parks and a 4-day canoe trip down an untamed river, camping in the wild. Active and close to nature in awe-inspiring landscapes during this hiking and camping tour in the famous parks of the Canadian Rockies. A week of exploring your guide’s favourite hiking trails is followed by canoe training and a glorious 4-day canoe trip down rivers from the Rockies into the northern wilderness. An ideal combination of sightseeing, physical challenges and a genuine Canadian nature experience. All transfers, transportation in passenger van, 2 nights in hotels (twin), other nights in spacious tents (2 pers. / tent), welcome gift, all camping meals from lunch day 2 to lunch day 13, camping equipment (except sleeping bag), hard-foam mattress, admission to the National Parks, camping fees, 5 days with 2-pers. open Canadian canoes, paddles, life vest, canoe bags in various sizes, bilingual guides. Personal equipment, sleeping bag and Thermarest mattress, alcoholic beverages, meals in the hotels. Guided soft adventure tour with easy to moderate hikes with light day pack. No experience necessary for the canoe trip. Your guide has the required qualifications and licenses and accompanies the group on all hikes. Typical Canadian outdoor program with mountain hikes and canoe trip. Seven guided hikes on beautiful Rocky Mountain trails. Canoe training and wilderness camping, even for inexperienced. All inclusive package from to airport. Guide always hikes with the group. Transfer from the Calgary airport to your hotel. You meet your guide and fellow travellers for the pre-trip information with the guide in the hotel. Through ranch country in the foothills you reach Banff National Park. In the generously laid out, forested campground (showers) you pitch your tent for the next two nights. Lunch on the campground and then you go for the first hike, perhaps following the shore of Lake Minnewanka or one if the many mountain trails. Dinner on the campground by the fire. Walking time 2 – 3 hours. You take the Transcanada Highway up the valley of the Bow River to famous Lake Louise in picture postcard scenery. The guide suggests the 3.5 km (2 mi) path with 400 m gain (1325 ft) to the historic tea house by an alpine lake. Here a network of easy to demanding trails is tempting you to go further and higher. For example the 15 km (9.3 mi) circuit into the Plain of Six Glaciers or a 2.5 km (1.6 mi) climb with 515 m (1705 ft) gain to a summit with exeptional views of nearby peaks and distant landscapes. Camp for today and tomorrow (showers) near the alpine village of Lake Louise. Hiking time 3 – 5 hours. The Kicking Horse River, rushing west out of the mountains, is perfect for white water rafting. Take the opportunity for 5 hours of thrills and lots of action in 8-person rubber rafts. But Yoho Park is also famous for its most outstanding network of trails to snow fields, waterfalls, fossil beds and other wonders in the high alpine. Let the guide take you on an 18 km (11 mi) loop with 880 m (2930 ft) gain through two passes alpine meadows and birds eye views of turquoise colored Emerald Lake. The Natural Bridge, Takakkaw Falls, Spiral Tunnel are other attractions of Yoho Park. Walking time 6 hours. The Athabasca Falls and a walk into it’s canyon count among the attractions of this park. Trails at the Columbia Icefields start almost at tree line which makes hiking in this area most rewarding. 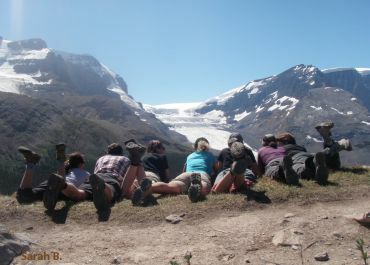 The guide recommends an 8 km hike with 335 m gain (5 mi, 1115 ft) into a pass at 2375 m (7908 ft) and a great view of the Athabasca Glacier. Walking time 2 -3 hours. You walk along Maligne Canyon, the river roaring through the narrow gorge, up to 50 m (165 ft) below you. Now a short drive to a pretty lake in the foothills where you prepare for the river adventure. In 2- person open Canadian canoes you learn the basic paddle strokes and safety precautions. You receive tips regarding personal equipment, work sharing of the crews and conduct in the wilderness. No experience is necessary. The selected river stretches are not dangerous, even for the beginner, but the current, numerous rapids, and gravel bars demand constant vigilance. Experienced canoeists find plenty of challenge in this wilderness setting. Safety and the comfort of the participants are the main concerns of the guides. Not needed luggage stays with the bus in safe keeping. Now you start the canoe adventure: For the next 3 nights you pitch your tent on sandy islands or comfortable spots along the shore. Your progress depends on the water level. The Athabasca River, fed by glaciers and clear forest streams, runs high and fast in the early season, clear, blue and lazy later into the summer. 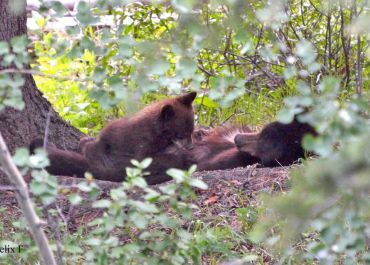 In the densely forested, uninhabited valleys you have excellent opportunities to spot wild geese, beavers, eagles, elk, bear, and moose. Five or six hours daily are spent on the river, sometimes leisurely drifting downstream, but always with an eye out for rapids and obstacles. There is time for swimming, fishing, exploring and campfires under the northern lights. 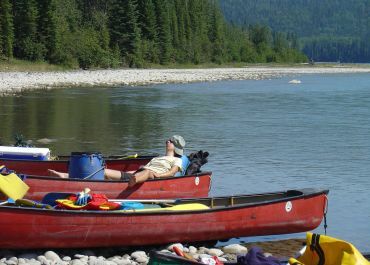 One more day on the Athabasca and after 160 km (100 mi) you reach the end of the canoe trip. The bus with the luggage you left behind is already waiting for the two hour ride to Edmonton. The hotel is not far from West Edmonton Mall, the gigantic shopping and amusement center. Your tour ends when you reach the hotel at app. 18:30 for the last night. If you stay another night in Edmonton we might be able to offer no-charge transportation to CALGARY for these tours. Please ask to confirm that we have a bus going. We gladly reserve an additional night for you in our hotel in Edmonton. Arrival in Calgary on Sunday at app. 3:30 pm.